What TV Shows Do You Regularly Watch? I haven’t written a TV-related post in quite a while, mostly due because I haven’t had too much time to watch some of my favorite programs for the past few weeks, so for today’s question I thought I’d ask what TV shows do you regularly watch. While I do watch many TV shows, the ones I always keep up with are Breaking Bad, Parks and Recreation, Mad Men, and Louie. 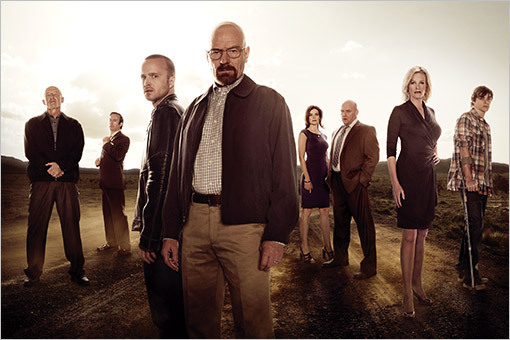 I’m a huge fan of Breaking Bad, which I discovered during its third season, and I’m eagerly awaiting the final season this summer. Parks and Rec and Louie are both great sitcoms and Mad Men‘s great as well. But which shows do you regularly see? The Walking Dead is a great pick. I’ve recently gotten into it. I watch Supernatural, the walking dead, game of thrones, breaking bad, elementary and a few others but these are my favorites. Breaking Bad, Justified and Ripper Street. Good to hear some Breaking Bad and Justified love. My wife and I are hooked on the Walking Dead. We’re up to Season 3 Episode 1. Fantastic show. It is a very gripping TV show. Thanks for commenting. Honestly? I rarely watch TV shows. The last TV show I watched religiously was LOST. Now all I watch on TV is sports and news. I do always DVR a couple of travel shows but that’s it. I’ve found myself having less time to watch TV than I have before, but when I get obsessed with a show, I spend much time watching it. DVR’s always great. Thanks for commenting. Yes!!! DVRs may be the greatest invention EVER!!! I haven’t watch TV shows in ages…used to do so a lot more. The only thing I regularly watch is Top Gear or a BBC nature series, but that’s about it. I used to watch TV much more as well. Top Gear is a great pick. I haven’t seen The Mentalist. I’ll check that out. Boardwalk Empire, Mad Men, Game of Thrones, TWD. For drama: Breaking Bad and Game of Thrones. Still need to get caught up on the latest seasons of Boardwalk Empire, Mad Men and Dexter. For comedy: Parks & Rec, The Office, Community (though the latter has been pretty bad this season). Great picks! Yeah, I’ve felt the same thing with Community this season as well. Hopefully it will improve later this year. wasn’t a fan of the last season. I also watch Modern Family, Parks and Rec, The Big Bang Theory. Great picks! I should probably see GOT much more. This is my first month without any sort of cable or sat. package so I am just streaming shows via netflix and hulu or mooching off my brothers HBO Go. Shows I am into: Breaking Bad, Sons of Anarchy, The Walking Dead, Game of Thrones, The Colbert Report and The Daily Show, o and recently got hooked on Dr. Who. Netflix and Hulu are great sources. Oh, I forgot The Daily Show and Colbert Report. I watch those all the time. Great picks and I’ve recently gotten into Dr. Who myself. Great picks. I could watch Arrested Development all day. I can’t wait for the new season. Nice post 🙂 Does Come Dine With Me count? haha! I actually haven’t heard of that show before. What is it about? Haha, we already have a lot of trashy TV in the US. We have a channel called The Learning Channel which primarily airs shows about rednecks. HA! that sounds AMAZING. I’ll youtube it. Sure it does. I used to watch hours of TV. Community’s been pretty hit and miss lately this season. There’s some great shows on TV but they always seem to have long hiatuses. I’m not sure when Mad Men’s going to come back on air. Thanks for commenting. Well I just dedicated a post this weekend to Downton Abbey so that’d be my answer 😀 I usually wait to catch up on shows so I could watch it on my own schedule though. I actually haven’t seen any episodes of Downton Abby. I’ll have to check it out. Thanks for the recommendation. Oh it’s excellent! I’m so addicted and I’ve only started just last week. I immediately made a post about it, ahah. Right now only watching The Walking Dead regularly. Started watching Vikings with Gabriel Byrne. I don’t have access to Game of Thrones, but I suspect the political intigue in Vikings is attempting to mirror it. Have only seen two episodes though. Have also watched one episode of Merlin so way too early to tell if Vikings or Merlin will be worth my time. Vikings appears promising. The Walking Dead is pretty great. I’ve heard about Vikings but haven’t seen any episodes. Thanks for commenting. Breaking Bad, Walking Dead and Dexter at present. Also catching up with sons of anarchy which is an awesome show. For me, Breaking Bad, Mad Men, Louie, Justified, Parks & Rec, Archer, Game of Thrones and The Venture Bros. I also have a soft spot for Restaurant Impossible. I’m currently eagerly awaiting season 6 of Mad Men and working my way through The Walking Dead and Dexter as they air. I’ve recently started Breaking Bad too, which I’m really enjoying. Great picks. I’m waiting for Mad Men to come back on air as well. Breaking Bad’s fantastic. How I Met Your Mother, Mad Men, Girls, Breaking Bad, Lost and American Dad.